Winter months call for comfort foods like chicken and dumplings, a crock pot full of chili, slow roasted pot roast or a bowl soup that will warm you right to your belly. And each can pair perfectly with the beverages of the Delaware Beer Wine and Spirits Trail. After you’ve purchased the ingredients to make your chicken and dumplings, it’s time to figure out how you’re going to pair this yummy dish. Wine Pairings: The rich and buttery flavors of Harvest Ridge Winery’s 2014 Barrel Fermented Chardonnay is a nice compliment to the buttery goodness of the dumplings. Beer Pairings: A light and refreshing brew, like 16 Mile Brewing Blues Golden Ale or Argilla Brewing Co. at Pietro’s Pizza Blonde on Belgian helps cut through the rich flavors of chicken and dumplings. Mead Pairings: The subtle, simple flavors of Liquid Alchemy Beverages Sweet Nothing will allow the chicken and dumplings to shine through. Cider Pairings: A dry Rebel Seed Cidery First Anthem Cold-Pressed Cider works well with chicken and dumplings, especially if the recipe contains leeks. There are so many variations of recipes for a piping hot crockpot of chili. You can make a Texas-style chili or a Southwestern style chili, or whatever your favorite recipe might be. No matter the style, chili is easy to pair with so many amazing beverages. Wine Pairings: Flavor matching is what it’s all about when you pair your chili with Nassau Valley Vineyards 2012 Cape Rose. Beer Pairings: A big bowl of chili calls for light lagers and hoppier beers. Bellefonte Brewing Co. Export Lager can help reduce the spiciness of a food like this.A Dogfish Head 90 Minute pumps up the spice level. Blue Earl Brewing Co. Top of the World Stout has a rich body to hold its own with the spices of a chili without getting lost. Spirit Pairings: The smoky flavors of a bourbon, like Delaware Distilling Company Pennsylvania Pumphouse Bourbon, can enhance the ingredients and spices while balancing out the spices of your favorite chili recipe. Mead Pairing: If you’re a lover of spice, Liquid Alchemy Beverages Thai-Grrr is a great pairing partner for you. The combination of Thai Chili Peppers and fresh lime will give you an extra punch of spice to your meal and palette. A slow roasted pot roast, with all the tasty sides and fixings like mashed potatoes and gravy and a helping of wintery root veggies, will pair with any number of Delaware-made beverages. Wine Pairings: A big, bold wine, like Pizzadili Winery Merlot, will stand up to the hearty flavors of pot roast. Beer Pairings: The roasted characteristics of Iron Hill Brewery Abbey Dubbel or a German-style Bock, like Fordham and Dominion Dopplebock, work well with a nice slow roasted pot roast. Spirit Pairing: Simple, complimentary notes in Painted Stave Distilling Old Cooch’s Corn Whiskeywill help enhance and heighten the herbs, spices and smokiness of a slow roasted pot roast. .
Mead Pairing: Black Current soaked in Liquid Alchemy Beverages Orange Blossom mead creates Current-Lee. 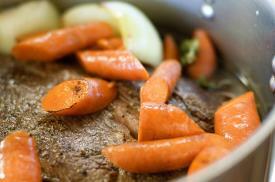 It’s mead that is reminiscent of Merlot and a great pairing for your slow roasted pot roast. Soup is just what the body needs when the temperatures drop. 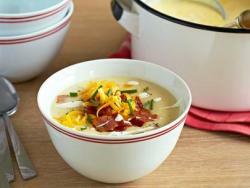 Whip up a batch of Baked Potato Soup, Kennett Square Mushroom Soup or classic Tomato Soup to warm you up all winter. And remember to pick the right drink to put alongside your bowl. • All Three: The creamier the soup, the more a full-bodied wine will pair nicely with them. Try Pizzadili Vineyard Chardonnay. • Baked Potato Soup: Pair it with a, a Seyval Blanc and Vidal Blanc blend from Nassau Valley Vineyards. • Mushroom Soup: Pour a glass of with a darker, more robust Pinot Noir, allowing the palate of the soup to showcase the earthy, mild flavors typically found in mushrooms. • Tomato Soup: The acidity found in tomato soup compliment and mellow the refreshing acidity of Harvest Ridge 2015 Vidal Blanc. • All Three: 16 Mile Amber Sun Ale is a nice go-to brew to pair with any of the three soups as it’s a nice middle of the road, easy drinking, easy pairing brew. • Tomato Soup: Enjoying the classic grilled cheese and tomato soup combo? A sweet and easy drinking pilsner, like Fordham and Dominion Pupilz Golden Pilz, will provide a nice snappy balance to the cheesy addition to your bowl of tomato soup. • Mushroom Soup: The intense, deep, smoky flavors of a dark stout like Stewart’s Brewing Co. Highlander Stout or Big Oyster Brewing On Point Stout will enhance and bring out the earthy flavors in Kennett Square Mushroom Soup. • Baked Potato Soup: A malty, refreshing pilsner, like Iron Hill Brewery Czech Pils or Mispillion River Brewing Not Today Satan IPA, is a nice counterbalance to a heavy ladle full of Baked Potato Soup. • Mushroom and Baked Potato Soups: The fresh apples, dark brown sugar and local honey used in Liquid Alchemy Beverages The Dark Cide(r) works nicely with your recipe for Kennett Square Mushroom Soup and Baked Potato Soup, pulling out the deep, rich flavors of each soup. • Tomato Soup: Liquid Alchemy Sweet Nothing is a nice subtle partner to Tomato Soup, letting the spices and aromas of the soup ingredients shine through.